Audrie Gordon, Senior Program Manager, PowerApps, 30 мая 2017 г. This feature was one that I personally was addicted to immediately! So, I am sure you're going to appreciate this new studio experience. The new Screen Explorer Tree View is an visual list of controls built into the left panel (which used to be just for screens). At the top level are the screens, and each screen expands to display the list of controls for that screen, enabling you to visualize, and to select controls, in an object-oriented and hierarchical manner. Hold on, there's more: the Tree View is not just for object visualization and selection, there are many helpful actions you can do from it as well, such as copy and paste, reordering, and/or deletions and renames of any screen or control. This will be especially helpful for previously hard to select controls that were hiding behind something else, or hidden due to the 'Visible' property setting)! Check out this interactive demo! Facilities knowledge transfer from one app designer to the next! Get started using this feature today, or learn more about navigating controls and screens here. 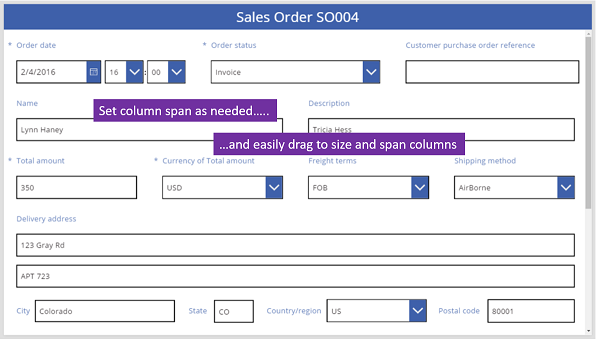 Find everything you need to get started using the Multi-Column form layout here. In the past, it was possible for app makers who share ‘edit’ rights to be able to overwrite the changes of others unintentionally. We have prevented this now with the new co-authoring notifications. With this release, app editors will be notified when the app is being revised, and will not be permitted to make additional changes until the app has been saved and closed. This is just one step forward towards our longer-term roadmap goals for complete application lifecycle management where co-authoring will be further enhanced. Stand by for more on ALM coming soon! Session expiry limitations prevent long-term lock outs due to app abandonment. PowerApps will automatically unlock the app for edits after 2 hours of inactivity. You may now format dates in the Date picker control to be displayed and input in the desired format. Example: Setting the Format property to “yy-mm-dd” would display the date as: “17-12-31"
Learn more about formatting the Date Picker control here. Do you work with data sources that store date/time values in UTC (Coordinated Universal Time)? Now you can easily convert local time to/from UTC time using the new TimeZoneOffset function and the new ability for DateAdd to work with smaller units such as minutes. Now you can convert between UTC and Local time. Many systems store date/time values in UTC. DateAdd and DateDiff now support hours, minutes, seconds, and milliseconds. For more information, see the DateAdd, DateDiff, and TimeZoneOffset documentation. The Office 365 Enterprise K1 Plan ( for Kiosks) is focused for frontline workers. Now organizations will be able to publish business apps out to kiosk-like work stations where hundreds of frontline workers may play them in support of retail store operations and productivity. This results in a simplified licensing model for large retail scenarios using PowerApps. Learn more about how to use PowerApps under the Office 365 Enterprise K1 plan here. We thank you for your ongoing feedback and support as we continue to enhance your experience using PowerApps and Flow!